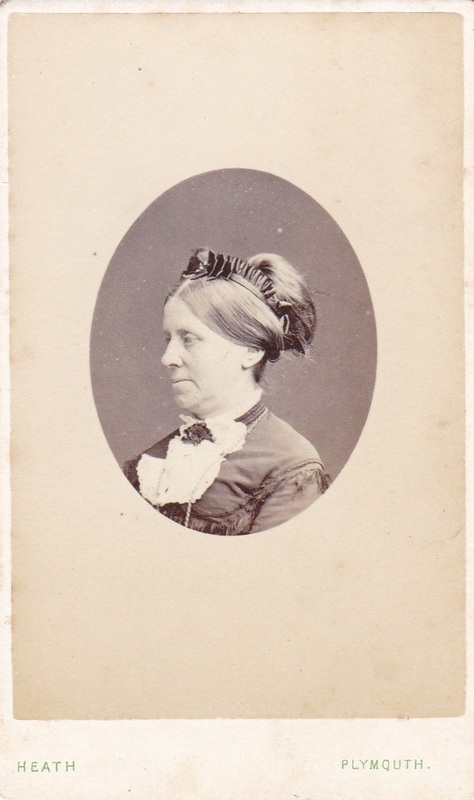 CDV (Carte de visite) measuring 2.5 x 4.25 inches. 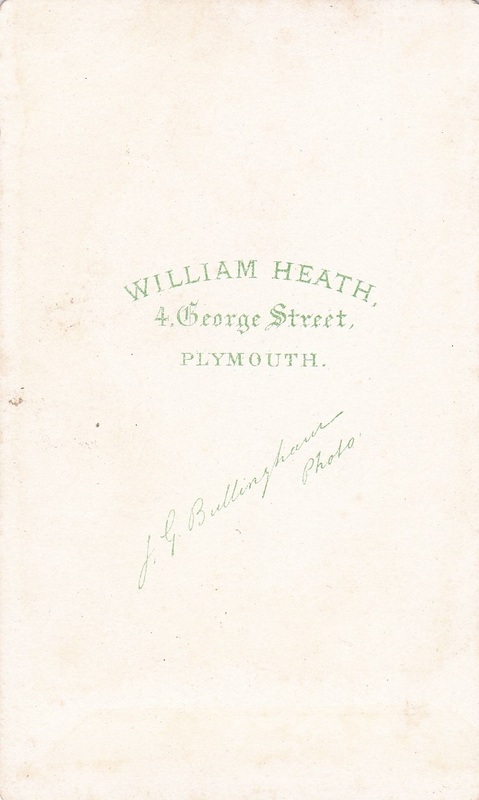 Photographer is (I believe) J. G. Bullingham, operating in the studio of William Heath, in Plymouth, England. One of the reasons I’ve been so lax on updating this blog, besides being busy and finding my attention drawn elsewhere, is that my old scanner wasn’t compatible with my new computer, making frequently scanning the old photos more cumbersome than it was worth. But I just got a new scanner! To celebrate its arrival today (and the fact that I actually managed to get it working), I decided to scan a photo and post it. I have plenty more to learn about the scanner, but it seems to be working for now. Meanwhile, there’s our lady in Plymouth to consider. Her hairdo isn’t one I’m familiar with, but I’m glad she posed in near-profile to best show it off. As for the photographer, the best I can figure is that Joseph Gould Bullingham (1849-1910, “photographer and farmer”, per the UK’s National Portrait Gallery website) was the photographer here, and William Heath was the publisher. I also found reference to a patent application by a William Heath of Plymouth (listed as an “optician and mathematical instrument maker”) for the invention of “an instantaneous shutter for use in obtaining photographic pictures” (though a quick search doesn’t turn up any reference to Heath being the inventor of the camera shutter). The address was listed as 24 George Street, while here it’s 4 George Street. Another reference shows Heath & Bullingham as photographers at 24 George Street. So it looks like the business evolved over time, and this photo was taken while they were working together, but before their business expanded into a full partnership. But I could be interpreting this information wrong, and the information itself could be wrong. But I like that story for now. My scanner also doesn’t work with my new computer (or, in fact, my old computer with its new operating system). My rage against Hewlett-Packard burns! Oh, no! I’d give you my old one, but I don’t think it would solve the problem. Fortunately, once I bothered to research it, I found that a newer version of the one I was already using was more affordable than I expected. I’ll e-mail you with the info. Welcome back Matt. Congrats on getting the New scanner to work! Glad you got a new scanner and that you are posting again.